Perhaps the hardest part of making it to Everest Base Camp during the average trek is just getting out of Kathmandu and the Khumbu Valley with your stomach unscathed. Water and food are frequently compromised by poor sanitation (overflowing sewage during monsoon season) and if you start the trek with a stomach bug it could hurt your chances of making it to Base Camp. Tusker’s owners, Eddie & Amy Frank started bringing their own food and cooking teams on Tusker’s first Everest Base Camp Trek in 2007 after a recon trip in 2006 revealed Nepal’s intestinal challenges. Francois Langlois, a well-known Canadian mountaineer, who had summited Kilimanjaro with Tusker numerous times, hired Amy and Eddie Frank to act as his medical team for his 30 trekkers to Everest Base Camp. Francois was impressed with the Franks’ expertise combatting high altitude sickness. But this first nightmarish journey revealed a different major threat. If Tusker was to successfully operate in Nepal it had to solve Nepal’s contaminated food and water issues. Many had gotten sick eating at the small lodges where the group stayed on their way to EBC. This is what most trekking groups do. 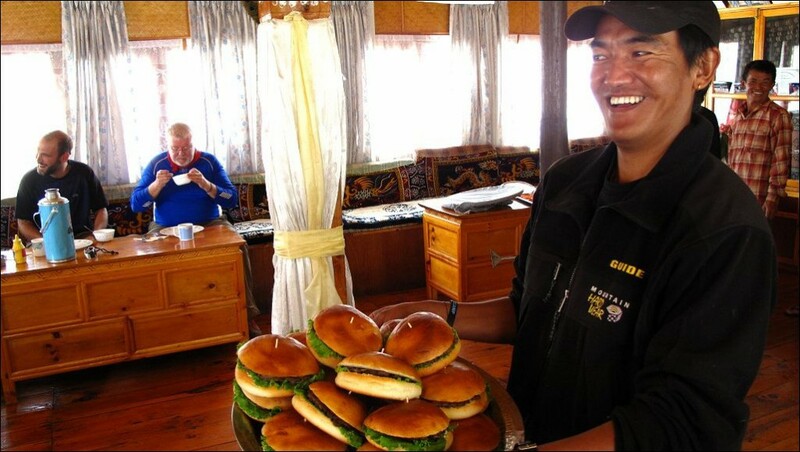 Most trekking companies on an Everest Base Camp itinerary feed their trekkers food prepared by the simple lodges along the trekking route to Everest Base Camp. Tusker takes a different approach, bringing its own Sherpa cooking crew and food. The crew purifies and boils all of the water used on the trip for drinking and cooking. When the group arrives in Kathmandu, Eddie and Amy take the group to restaurants that they have personally vetted. Eddie estimates that less than five percent of Tusker clients have gotten the dreaded “Delhi Belly” during the decade Tusker has operated in Nepal. “We follow a strict hygiene regime and have our trekkers carry hand sanitizers in their pockets and remind them to constantly wash their hands. We frequently remind them to keep their hands out of their mouths and nose and to avoid physical contact with others,” Eddie said. We who love adventure travel must educate ourselves and recognize the inherent risks journeying into the developing world. Throwing ourselves blindly onto the culinary claws of chance is a bad idea. Eating food off the street from food cart vendors in Kathmandu leads to hikes to the bathroom and possibly the hospital. Nepal’s capital has 1.5 million people with stomachs long tested by contaminated food and water and they get sick too. Tusker’s motto has long been, “Understand the problem and be proactive,” and it has paid health dividends keeping its trekkers out of the hospital and on the trail to the foot of Mount Everest. That’s a high culinary achievement.